Cause & Effect...A Little About Me--Alot owed to Layne. I remember that it was "Music Bank", a collection of all their different videos, that I watched that very first night. Ironically enough, this was just a mere two weeks after Layne's passing, and two weeks after my twenty-first birthday. 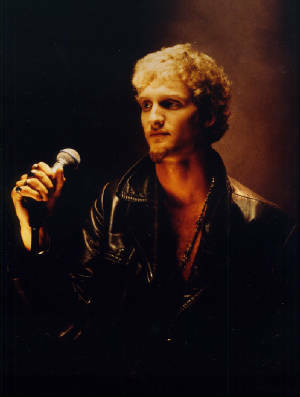 Anyway, I was mesmorized...not only by the intensity of the music, but by Layne's powerfully primal voice, and the fact that almost every word that came out of his mouth was the very thing I had been trying to say and holding on the inside of me for so very long. I honestly asked myself, "Where the hell has this music been all my life?" And I've been in love with it, ever since. Had Layne's music not come into my life when it did, it might not have influenced me to become more introspective about my life, my actions, and the way I affect the people around me. What we should always remember when listening to his work is that first and formost, it is art. Secondly, it is an expression of his soul, and a release of the inner torment that he felt. It was a means of communication to others, to sit up and to pay attention to the consequences of the actions he had taken; it was meant to make people stop and think. The question that I ask for the rest of you out there is this: DID IT WORK? This picture was taken two years ago...so it's not real recent, but it's the best I can do at this point. This is me two years ago. Picture taken by my best friend, Chris. Star Wars series; Superman series; Vanity Fair; Underworld; Willow; Buffy The Vampire Slayer; Minority Report; The Hours; Sin City; Girl, Interrupted; Tomb Raider--1 &2; I, Robot; ET; Ghostbusters--1&2; The Matrix series; The Animatrix; The Nightmare Collection; Freddy vs. Jason; Resident Evil; Resident Evil: Apocalypse; Finding Neverland; In Hell; Edward Scissorhands; The Secret Window; Running on Empty; Stand By Me; Chicken Run; Braveheart; Gone in 60 Seconds; Gone With The Wind...the list could go on forever. Alice In Chains; Mad Season; Joan Jett & The Blackhearts; The Runaways; Billy Idol; Three Days Grace; Nickelback; John "Cougar" Mellencamp; Kenny Loggins; Pat Benatar; Eddie Money; Kim Wilde; Huey Lewis & The News; George Strait; Sara Evans; Joe Diffie; Restless Heart; Sawyer Brown; Shenendoah; Keith Whitley; Diamond Rio; Jo Dee Messina; Patsy Cline; The Eagles; Genesis/Phil Collins; Duran Duran; Def Leppard; Ratt; Poison...this list could go on for awhile, too. To Jesus Christ: Thank you. For Nancy, Layne, Phil, Jim, Liz, Jaime, Oscar, and Demri. With all my undying love. For my mom & dads: I love you very much. For more information on Alice In Chains, go to www.aliceinchains.com. Thanks to everyone for keeping Layne's memory alive, and for stopping by to check this site out. It means alot.